The Aishwarya AmritaSREE SHG functions in the village of Thottapilli in Purakad Panchayat. The group’s source of income is making and selling snacks. 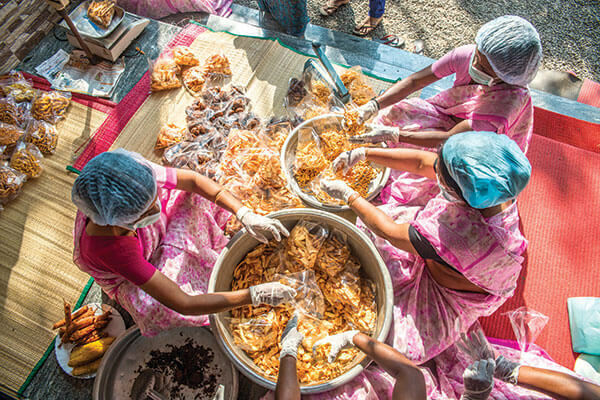 Out of 30 members, seven have been trained in preparing different kinds of snacks such as chips, mixtures, unniyappam and murukku. The group members sell their produce in shops and door to door. They started the venture with a bank loan guaranteed by the AmritaSREE head office that has been completely repaid. Their sales total is Rs. 60,000 per month, with Rs. 20,000 net profit.